An abstract pattern engraved in a piece of ochre found at Blombos Cave in South Africa. Image: Chris S. Henshilwood. Abstract art goes back a long way. The earliest examples are around 73,000 old and consist of abstract patterns engraved into pieces of ochre by natives of what is now South Africa. During the last ice age, around 40,000 year ago, European artists also left abstract designs, this time on the walls of caves. What is striking about these early manifestations of abstract expression is that the patterns drawn were the same across cultures and locations: there are dots, cross-hatchings, circles, wavy lines and, in particular, spirals. These geometric patterns resemble what people report seeing when they are in altered states of consciousness, causing researchers to suggest that much of early abstract art was inspired by drugs. Apart from scandalising the Daily Mail this idea also poses a question: why would people across continents and ages all favour patterns seen during drug induced hallucinations over the many others they could have chosen to paint? What makes drug induced visions so compelling? A recent paper by computer scientists from Japan suggests that the answer might hinge on an interesting interplay between the mathematics of pattern formation and a mechanism that generates a sense of value and meaning. The geometric patterns seen in visual hallucinations were first studied scientifically in the 1920s by the German-American psychologist Heinrich Klüver. Klüver experimented with peyote, a cactus whose psychoactive ingredient mescaline played an important role in the shamanistic rituals of many central American tribes. Popping peyote buttons in the lab Klüver noticed the repeating geometric shapes and classified them into four types, which he called form constants: tunnels and funnels, spirals, lattices including honeycombs and triangles, and cobwebs. Computer generated representations of Klüver’s form constants. 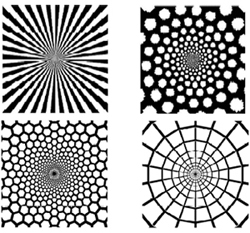 The top two images represent a funnel and a spiral as seen after taking LSD, the bottom left image is a honeycomb generated by marijuana, and the bottom right image is a cobweb. Image from What Geometric Visual Hallucinations Tell Us about the Visual Cortex by Paul C. Bressloff. When it comes to understanding pattern formation in nature scientists often look to the work of Alan Turing, better known as WWII code-breaker and father of modern computer science. To explain the formation of the stripes and spots we see on animal coats Turing considered a system of two chemical agents (loosely speaking, one for each colour in a two-coloured animal coat) which diffuse through a medium (the cells making up an animal embryo) but also interact with each other in a specific way. Writing down the equations describing this process Turing found that once the system is nudged out of equilibrium it polarises. Rather than forming a uniform mixture the agents arrange themselves in a variety of possible patterns (see How the leopard got its spots for more detail).